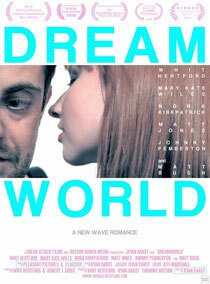 Review: Ryan Darst's "Dreamworld" starring Whit Hertford and Mary Kate Wiles. - Films de Lover, films d'amour et comédies romantiques. It's still a great joy for me when I discover a new indie romance film available worldwide on VOD. "Dreamworld" caught my eye thanks to its stylish poster and trailer that featured a great piece of music, even if the script looked unoriginal for a romance movie. Because "Dreamworld" is a variation on the very very very very common nowadays Manic Pixie Dream Girl trope where a crazy girl turns upside down the life of a guy. It seems that this MPDG is part of every indie romance films released these last ten years. It's annoying but at least Mary Kate Wiles is perfect for the part of Lily Blush. She faces Whit Hertford as the poor guy that will lose a lot before rebirthing as a new man thanks to that tornado of a woman. The two of them are great but as a couple it's hard for the viewers to see what she could see in him, apart wanting to save him from its life. The production quality of "Dreamworld" is great. Nice shots, great pictures, fantastic soundtrack, it's very nice to watch even if sometimes the lack of budget shows (especially in the second part of the film when the script becomes a bit disjointed). The romance in the first part of the film disappears a bit in the second part when the story becomes very intimate, very personal like a reflection on Whit Hertford's life (he's the screenwriter for the film). It's an emotional punch when we least expected it. Not very romantic but it shows that the film has its heart in the right place and we do forgive it gladly. It also manages to tie each story arcs quite nicely in the end so it's well worth your money for the very low price it's asking. Synopsis: Aspiring animator Oliver Hayes meets the captivating and impulsive Lily Blush and agrees to take a road trip to Northern California in the hopes of fulfilling his fantasy of working for Pixar Animation. During their travels Oliver falls deeply in love, but after a string of startling discoveries he'll either have to face reality, or stay in a DREAMWORLD. Available for $2,99 on Vimeo on Demand.